I have this on my wall today. I have gone back and looked at my old notes and stretch book from the Nancy Crow workshop I took 10 Years ago. I had a chance to take a week long class with Martha Cole about the creative design process. On the first day I chose to repeat an old exercise from a Nancy Crow class. 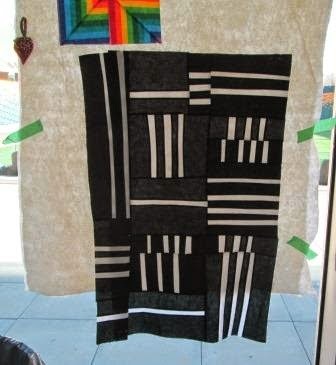 Here is the strips on the wall before I sewed them together. Here it was when I finished the sewing. I first thought yes it is good. Well later in the week Martha asked me to write out what I liked and loved about some of my work. This is one that I looked at. It was a hard exercise but very very helpful. I was not to write down Negative things. Make no comment on the parts or things I did not like. I wrote things like "I like the unevenness of the top lines". Or " I like the sets of three lines". 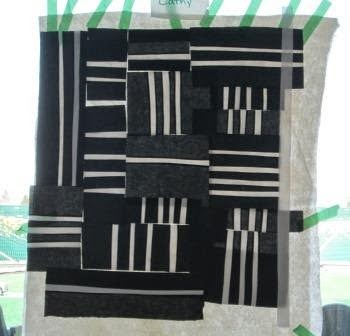 I also wrote out statements like "I love to piece quilts" So I commented on the process of the art work I make. "Eat the Dessert and leave the crap sandwich behind". A little quote from one of my Dog Agility teachers. It was about talking about the good parts, what was done well or what was good and do not dwell in the bad stuff. Martha was saying the same thing all week long. I have to do this more. 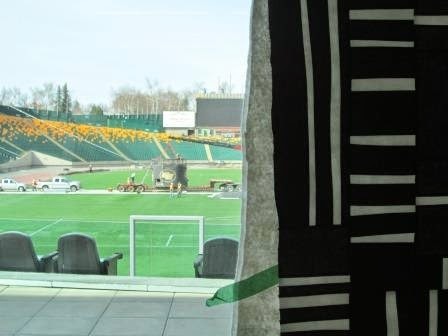 Our class was in a meeting room of the Commonwealth Stadium and we could look out to the main field. They are doing some work to upgrade the stadium. This is were the Edmonton Eskimos foot ball team plays. Our class room was one of the best rooms I have been in. 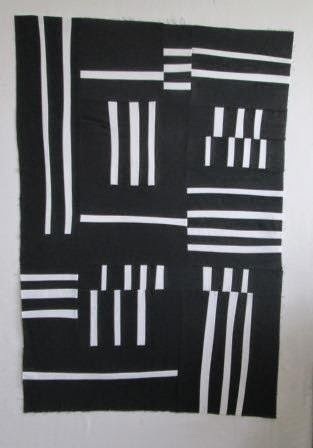 I have added this to Patchwork Times Design Wall Monday. Well after looking at this more closely I folded one part of the quilt out of the way. Wow I liked that even better. The art work became stronger. So I changed it. I took out some of it. And what you see in the top photo is how it is now. I am not sure if I will repeat this in colour or not. Maybe. 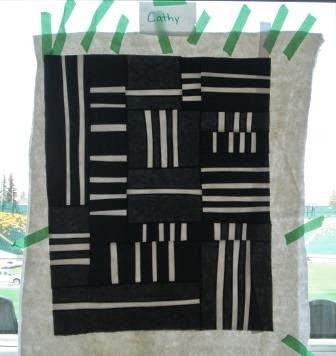 I like this piece very much Cathy -- and I enjoyed reading about the process Martha had you undertake. Thanks!